It means that Book of Monster Templates was very profitable for Rite Publishing, and even after the initial 30 days we are still seeing 30 sales a month. I think it also shows that if your primarily a PDF company your customer base is still PDF based as we sold 57 PDFs at paizo vs. 41 Print copies at Paizo, It proved to me that you really need mainstream distribution and really has caused me to embrace my partnership with Cubicle Seven when it comes to print products. If you don't think Reviews have an impact your wrong, many people wait for for a review before they purchase I product. I will also point out, its about ego, reviewers are the first and most detailed form of feedback you as a designer are about to get. So the average rating is 4.75 out of 5 Stars. What did I learn from them, that I should have given the proofreaders more than a week to go over the product, but I had a release date set in my mind and I would not miss the release date. I also saw some grassroots come out in a podcast I did not even listen to or know existed. 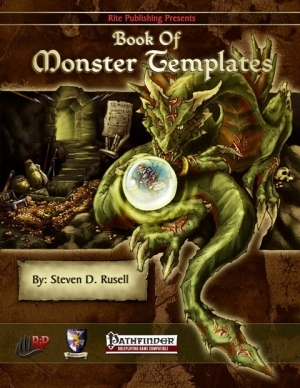 So as far as Rite Publishing is concerned The Book of Monster Templates is both a Critical and Economic success and I am working on a sequel of sorts, The Book of Simple Monster Templates. Very nice Steve. BRAVO! Thanks for sharing this. I'm still trying to figure out how to do this well. Perhaps in time, as our catalog expands, we'll see it happen. I really don't think its about catalog, I think its about marketing the right product well. Book of Monster Templates was the right product, As neither Paizo nor other 3rd Party Publishers were filling this need, and we had good response to our open discussion of the product's development of on the Paizo Compatibility Forum, I am considering the next time I do something like this hosting an open playtest, in the same manner as Dreamscarred press did with thier psionics book. I hope one day Nevermet Press will find itself working with the Pathfinder RPG. I'm wondering about your characterization of this as profitable. By my admittedly back-of-napkin figuring (based on the PDF and print price, what I know of cost of production at Lulu and OBS, and the standard publisher cut of 65%), you saw somewhere in the neighborhood of $1300 for the first quarter. This is a 108 page book, and from the look of the preview, fairly text heavy (let's call it 40,000 words) with a piece of art every 4-5 pages or so (at a guess -- 24? ), plus cover. Assuming a bare-bones rate of 20 bucks per illustration, and 2 cents per word, that's $1280, and doesn't take into account editing, layout or the cover illustration. The Cover art and back cover art were the only original pieces created for this book, all other remaining artwork was royalty free stock art or art from other projects. Ah! That helps a bunch! I think this thought is key: "I really don't think its about catalog, I think its about marketing the right product well." I am simply a consumer, but over and over, the products I buy fit that category. Interesting numbers, Steve. We're getting ready to release our first Pathfinder product (a conversion), so we're glad to see third-party products doing well.